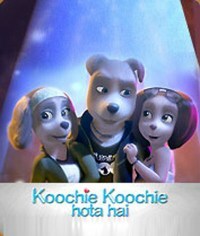 …and India's Animation Xpress is celebrating it in an especially animation-furry way. Confused? The United Nations declared July 30 to be International Day of Friendship; as with May Day, some areas have their own traditions. 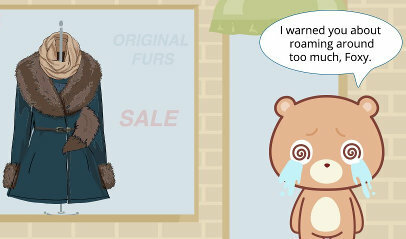 Baidu's campaign, which started June 1st on Facebook and Twitter, shows the ultra-cute DU bear interviewing critically-endangered species living in India, such as the Himalayan brown bear, as well as other popular species of lesser concern, such as the Bengal fox. Okay, here’s another stealth movie. Billu Gamer, a 90 plus minute live-action/animated Hindi comedy-fantasy feature from director/producer/writer Pankaj Sharma at Astute Media Vision, coming in India in May 2016. Sharma says that it’s slightly over half VFX and 3D animation. Patty is a live-action teenage boy at a school where a lot of Bollywood-style singing and dancing goes on. When he’s depressed from being bullied, the animated Billu from his favorite video game comes to life to be his best friend. Everything seems great, until the video-game villains follow Billu into the real world. Patty and Billu have to team up in the video world to win. The first half of the trailer is live-action; then the animated Billu and some dog-headed humans appear, and there are an animated tiger and an angry elephant. There’s more information at The Hans India. For the record, funny animals in Kannada (that’s Kannada the language, not Canada the country) can be found in Tunturu, a children’s magazine published since January 2000, originally bi-monthly but semi-monthly today. Tunturu has been able to carve for itself an identity of being the most sought-after children’s magazine across the age-groups of 5-14 in Karnataka. If you don’t know where Karnataka is, you can look it up. Reportedly an English-language edition is coming soon. It’s ₹8 an issue, but you can subscribe to it in America for $5.99 for three months. And that's probably more about funny animals in Kannada than you want to know. Whee! We’re bringing you announcements from Cartoon Brew of lots of international animated theatrical features that will probably never come to the U.S. This time it’s a French movie, variously Evolution Man, or, How I Ate My Father or Animal Kingdom: Let’s Go Ape, that is being released theatrically in Britain this month. 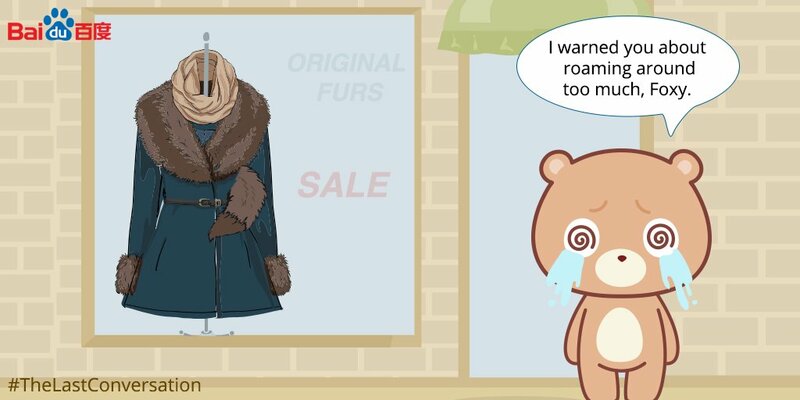 Is it anthropomorphic? Surely, if you consider pre-homo sapiens primates to be animals. Otherwise? Hard to say from this trailer (which is one of two), but there are at least lots of animals presented in a manner that furry fans should enjoy. YouTube has the first teaser trailer of the Disney studio’s April 15, 2016 “live-action” (heavily VFX) adaptation of The Jungle Book, directed by Jon Favreau, and it’s definitely full of anthropomorphic animals. 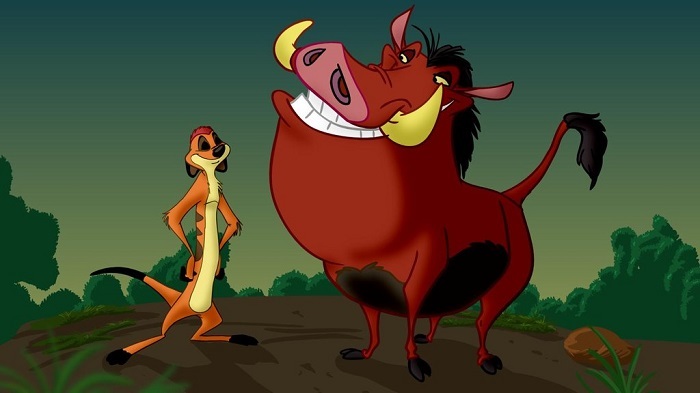 The voice actors include Bill Murray as Baloo, Scarlett Johansson as Kaa, Idris Elba as Shere Khan, Ben Kingsley as Bagheera, Lupita N'yongo as Raksha, and Christopher Walken as King Louie. As you can see, it will be a mixture of Rudyard Kipling’s 1894-‘95 literary classic and Disney’s own 1967 animated classic. A lot of this was revealed at Disney’s D23 Expo in August, but now you can see it for yourself. 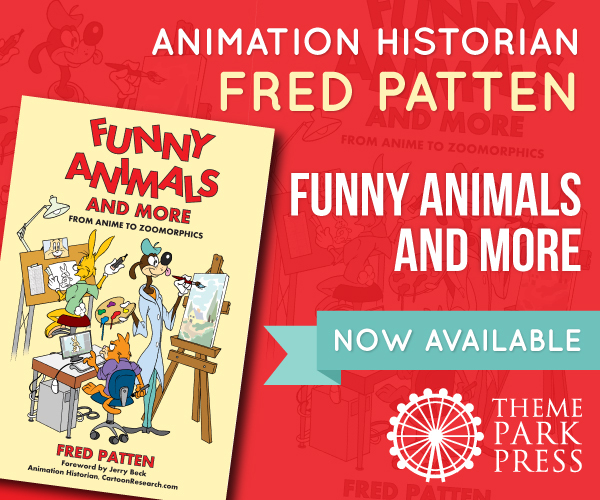 Funny Animals and More: From Anime to Zoomorphics, based on Fred Patten’s weekly columns from Jerry Beck’s Cartoon Research animation website, was published March 26 by Theme Park Press. It is available in paperback and digital formats, and on Amazon.com. The book is about animation and comic books rather than specifically anthropomorphic animals, but cartoon and CGI funny animals are a major theme. Topics include anime cat girls; Pokémon and Monster Rancher; Astro Boy and Atomcat; how a popular 1970s anime TV series led to the import of thousands of baby North American raccoons into Japan as pets, whose descendants are ruining thousand-year-old Buddhist and Shinto shrines today; animated Summer Olympics mascots like Misha the bear cub, Sam the eagle, Hodori the tiger, and Cobi the sheepdog, from 1972 to 2012; Patten’s favorite childhood comic-book funny animals like Amster the Hamster, Doodles Duck and his nephew Lemuel, Nutsy Squirrel, Dunbar Dodo, and SuperKatt, and how he would still like to see them animated; Crusader Rabbit; rats in animation; Reynard the Fox in animation; and Disney’s forthcoming 2016 Zootopia. Animation: 'Chhota Bheem' comes to the U.S. The notice does not say how long it is playing at each, but probably for one week, so you should have time to see it if you hurry. The news also does not say whether it is dubbed or subtitled in English; it was dubbed in Hindi for its Indian theatrical release last year. Despite the implication on Flayrah, Los Angeles is not the only city to have festivals of animation with anthropomorphic stars. On February 28th through March 24th, the 16th Annual New York International Children’s Film Festival will play at seven different locations in NYC. The Festival will screen 100 different films (some live-action), and is expected to draw an attendance of 25,000+. It will present many of the films in the U.S. for the first time, to qualify them for 2013 Oscars. 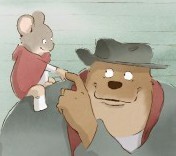 Among the films are several that have been covered on Flayrah, including the Belgian Ernest & Celestine, about a mouse and a bear who become friends (French with English subtitles; Feb. 28 at Tribeca Cinemas); The Wolf Children (Ame & Yuki, the Wolf Children), about a college student who marries a werewolf who dies, and must raise their two werewolf toddlers alone (Japanese with English subtitles; March 3 at the Asia Society and 16 at SVA); The Day of the Crows, mostly about a feral child raised in the forest, but with some fantasy scenes of anthropomorphic animal-headed forest spirits (French with English subtitles; March 10 at FIAF); Welcome to the Space Show “with an intergalactic cast of thousands” (premiere of the English dub; March 9 at SVA), and Meet the Small Potatoes, for pre-schoolers about a musical group of animated potatoes who rise from small-town beginnings to international rock stardom (March 16 at the IFC Center and March 24 at the DGA Theater). 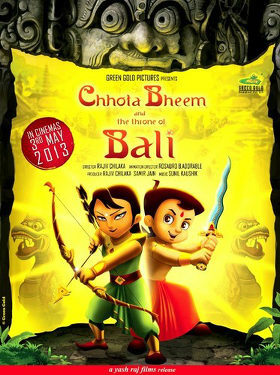 Animation Xpress #415, January 7, 2013, has the first trailer for Indian studio Green Gold Pictures’ second Chhota Bheem animated CGI children's feature, Chhota Bheem and the Throne of Bali, following the smash success (in India, in Hindi) of last year’s Chhota Bheem and the Curse of Damyaan. As before, the movie is not really anthropomorphic, but it does have Bheem’s talking monkey friend Jaggu (“Jaggu is surprisingly kickass”), and the trailer shows lots of evil Rangda’s anthropomorphized monsters. Out May 3, 2013 in India, in Hindi. 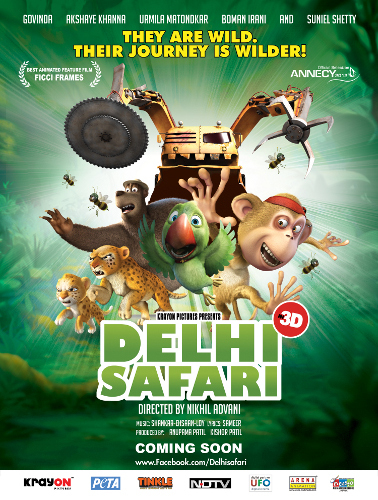 Delhi Safari is a new full-length CGI animated feature from India, directed by Nikhil Advani and animated by Krayon Pictures. It tells the story of a group of rainforest animals in India, who find their forest is being destroyed and paved over by human encroachment and construction. They take it upon themselves to travel to Delhi, with the intention of using a “bilingual” parrot (he speaks both human and non-human languages) to voice their complaints about the destruction of their home. The film has been picked up for international distribution by Fantastic Films, and it recently opened for a limited engagement in North America. 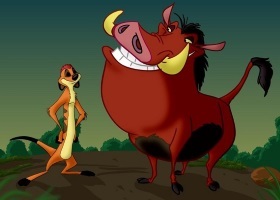 Filmed in Hindi, the English version of the film features the voices of Jason Alexander, Cary Elwes, Christopher Lloyd, Jane Lynch, Vanessa Williams, and Brad Garrett. Watch the international trailer on YouTube, or visit the Delhi Safari Facebook page. So the camel can talk. Can he fly? Have you ever heard of Kamlu ...Happy Happy, a 3D CGI Hollywood-Bollywood co-production directed by Govind Nihalani that will be released on November 2? In India, anyway, in Hindi. Produced by Krayon Pictures, the same studio that made Delhi Safari, in fact. This English-language trailer shows it to be a children’s fantasy about a young talking camel who wants to fly, who gets mixed up with a human princess, an enigmatic magician, lots of villains, and so on. Will it play in America? I’m sure the Bollywood producers hope so.